A remarkable 19th century Regency style polished steel fireplace insert. A framed outer plate with applied beading centred by a steel and brass tablet with a central eye embellishment, the polished three bar grate, flanked by polished brass masks to the side cheeks, with a pair of tall steel and brass finials, a full width pierced apron and directly below, a removable ash door to the base, all fully restored and polished. English. This insert has cast brass details with a simple mahogany frame surround. Measures: Opening height 64 cm Opening width 61 cm Weight 22 kg. 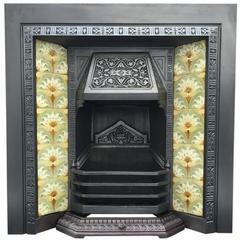 An early Victorian cast iron fireplace insert. Finely cast with foliage decoration to arch and interior, with original trivets flanking the burning area. Early 19th century Regency fireplace surround in subtly figured green grey slate. The fluted frieze is flanked by traditional bullseye end blocks above fluted jambs, circa 1810. 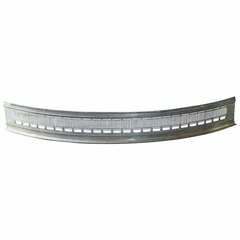 English fireplace fender - fire fender.